1) (Rhyd-y-Carew, co. Montgomery; descended from Llewellin, Lord of Yale, temp. William I.; the heiress, Sarah Evans, m. Charles Davies, Esq., of Llivior). Az. a lion ramp. guard. or. Crest—A stag trippant ppr. horned and hoofed or. 2) (Trefeiler, Plas-Gwyn, and Henblas, co. Anglesey). Quarterly, 1st and 6th, ar. three war saddles, two and one, sa. stirrups or; 2nd, or, a lion ramp. reguard. sa. ; 3rd, ar. a chev. sa. betw. three Cornish choughs ppr. each holding in the bill an erm. spot; 4th. sa. a lion ramp. ar. within a bordure engr. or. ; 5th, or, a chev. betw. three mullets sa. Crest—A cubit arm erect, holding in the hand a torch inflamed, also erect, all ppr. Motto—Heb Dduw heb ddim Duw a digon. 3) (Eyton, co. Hereford; descended from Evans, of Trefeilir and Henblas, co. Anglesea). Quarterly, 1st, ar three war saddles, two and one, sa., stirrups or, a mullet for diff. ; 2nd, or, a lion ramp, reguard. sa. ; 3rd, ar. a chev. sa. betw. three Cornish choughs ppr. each holding in the bill an erm. spot; 4th, sa. a lion ramp. ar. within a bordure engr. or, on an escutcheon of pretence or, a fesse az. cotised gu. charged with two garbs of the first, for Weaver. Crest—A cubit arm erect, holding in the hand a torch inflamed, also erect, all ppr. 4) (Moreton Court, co. Hereford; of ancient Welsh descent). Quarterly, per fesse nebuly erm. and sa. three boars’ heads in chief and one in base, erased, counterchanged, quartering Ar. two chevronels, and in chief three griffins pass, az., for Finch: Crest—A lion ramp. reguard. bendy of six erm. and sa. supporting a tilting spear erect ppr. entiled with a boar’s head erased sa. Motto—Libertas. 5) (The Hill House, co. Hereford; this family inherited their estate, in 1806, from Richard Clarke, Esq.). Per pale az. and gu. three lions ramp. ar. armed and langued or, a crescent for diff. Crest—Out of an earl’s coronet or, a dexter arm embowed naked, brandishing a dagger ar., pommel and hilt gold guttee de sang. 6) (Llaneurgain, co. Flint). Ar. a chev. betw. three boars’ heads couped sa. 7) (Northope, co. Flint, and co. Salop). Same Arms. Crest—On a ducal coronet or, a boar’s head fesseways erased sa. 8) (co. Montgomery; now of Portsea, co. Southampton). Ar. a lion pass. sa. betw. three fleurs-de-lis gu. Crest—A lion pass. sa. 9) (Oswaldestre, co. Salop). Watstay, co. Denbigh, descended from Thomas Evans, Esq., of Oswestry, Attorney-General in the Court of the Marches. Jane, dau. and heiress of Etton Evans, m. Sir John Wynn, Bart., who changed the name of the place to Wynnstay). (London). Ar. a fesse betw. three fleurs-de-lis sa. Crest—An arm embowed and erect, vested gu. euffor, holding in the hand a pink or gillyflower ppr. stalked and leaved vert. 10) (Shrewsbury). Or, a cross moline betw. four lozenges az. 11) (Llanrwst, Wales). Ar. three spears’ heads sa. embrued gu. 12) (Tre Castell, Wales). Gu. a lion ramp. within a bordure indented or. 13) (Wales). Ar. a fesse gu. betw. three boars’ heads couped sa. 14) (Wales). Ar. a chev. gu. betw. three birds az. 15) Gu. three chev. ar. Crest—A paschal lamb pass. holding a banner all ppr. 16) Sa. a lion ramp. reguard. or. 17) (descended from Rhirid Flaidd, a chieftain of North Wales, temp. William I.). Vert a chev. erm. betw. three wolves’ heads erased ar. langued gu. 18) (Welland, co. Worcester). Ar. a cross flory engr. sa. betw. four Cornish choughs ppr. on a chief az. a boar’s head couped of the first, tusked or, langued gu. 19) (Upper Mill Pool, co. Montgomery, Thornelow House, co. Worcester, and Whitbourne Hall., co. Hereford). Per pale ar. and gu. a lion pass. reguard. betw. two fleurs-de-lis in chief, and in base a bundle of rods banded, all counterchanged. Crest—A lion pass. reguard. ar. charged with three crosses moline gu. and the dexter paw resting on a bundle of rods banded, also gu. 20) (the Venble. Thomas Evans, Archdeacon of Worcester). Ar. a fess engr. betw. three eagles’ heads erased sa. Crest—An eagle’s head erased sa. 21) (Marsh-Gibon, co. Bucks). Ar. an eagle displ. with two heads sa. Crest—An eagle’s head betw. two wings sa. holding in the beak a rose gu. stalked and leaved vert. 22) (Tuddenham, co. Norfolk, and Dene, co. Oxford). Ar. three boars’ heads couped sa. ornaments gold, charged on the centre of the cover with a fret of the last, and in base an eagle rising or. Crest—A dexter arm erect, couped at the elbow, habited barry wavy of six az. and or, cuff ar. holding in the hand a parchment roll both ppr. 24) (Forde Abbey, co. Dorset). Quarterly, 1st and 4th, ar. three boars’ heads couped sa. langued az., for Evans; 2nd and 3rd, az. a cross pattee erm. betw. four fleurs-de-lis ar., for Ward. Crest—A demi lion reguard. or, holding betw. the paws a boar’s head, as in the arms. Motto—Libertas. 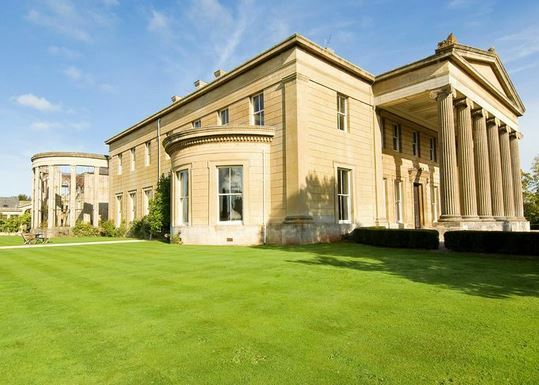 25) (Allestree Hall, co. Derby). Gyronny of eight ar. and vert a lion ramp. guard. or, for Evans; quartering Per bend indented ar. and gu. two lions’ heads erased counterchanged, ducally crowned or. Crest—In a charger, a boar’a head erased ar. 26) (granted to William Evans, Esq., of Lynnon, co. Carnarvon). Ar. on a chev. gu. betw. three martlets sa. two swords in saltire ppr. pommels and hilts or, entwined by a double chain of the last. Crest—The Roman fasces fesseways, thereon a lion ramp. holding in his dexter paw a scymitar all ppr. 27) (granted to Lieut.-Gen. Sir De Lacy Evans, G.C.B.). Ar. a mural crown gu. betw. three boars’ heads couped sa. Crest—Out of a mural crown gu. a demi lion reguard. or, holding betw. the paws a boar’s head couped sa. Motto—Espana agradecida. 28) (Dublin; Fun. Ent. of John Evans, Alderman and twice Mayor of the City, d. 1 Jan. 1632, buried in St. John’a Church). Bendy of six ar. and gu. on a fess az. betw. three eagles displ. sa. as many mullets or. 29) (Lord Carbery; George Evans, eldest son of Right Hon. George Evans, so created 1715). Ar. three boars’ heads couped sa. langued gu. Crest—A demi lion ramp. reguard. or, holding betw. the paws a boar’s head, as in the arms. Supporters—Two lions reguard. or, ducally crowned az. Motto—Libertas. 30) (Portrane, co. Dublin; descended from Eyre Evans, brother of George, first Lord Carbery). (Ash Hill Towers, co. Limerick, and Miltown Castle, co. Cork; descended from Thomas Evans, brother of George, first Lord Carbery). Ar. three boars’ heads couped sa. Crest—A demi lion ramp. reguard. or, holding betw. the paws a boar’s head, as in the arms. Motto—Libertas. 31) (Knockaderry, co. Limerick; confirmed to Thomas D’Arcy Evans, Esq., of Knockaderry). Quarterly, 1st and 4th, ar. three boars’ heads couped sa. langued gu., for Evans; 2nd and 3rd, ar. three cinquefoils gu., for D’Arcy; Crests—1st, Evans: A demi lion ramp. reguard. or, holding betw. the paws a boar’s head, as in the arms; 2nd, D’Arcy: A tilting spear broken in three pieces, the head in pale, the others in saltire ppr. banded gu. Motto—Libertas. 32) (Kilcreene, co. Kilkenny; bart., extinct. Sir William Evans, eldest son of Thomas Evans, Captain of a troop of horse, temp. Charles I., was created a bart. of Ireland, 1682; his dau. and eventual sole heiress, m. Francis Morees, ancestor of the Viscounts Mountmorres and Frankfort). Ar. three boars’ heads couped sa. 33) (Gortmerron, co. Tyrone; descended from Edward Evans, High Sheriff, co. Kilkenny, 1665, brother of Sir William Evans, Bart., of Kilcreene). Erm. three boars’ heads couped sa. langued gu. Crest—A demi lion ramp. reguard. erm. holding betw. his paws a boar’s head, as in the arms. Motto—Libertas. 34) (granted to Rev. George Evans, of Armagh, and to Thomas, Robert, and Edward Evans, Esqs., sons of Edward Evans, Esq., of Dungannon, co. Tyrone). Erm. three boars’ heads couped sa. armed and langued gu. Crest—A demi lion ramp. reguard. erminois, holding betw. the paws a boar’s head, as in the arms. Motto—Libertas. 35) (Davies-Evans; exemplified to Herbert Davies, Esq., upon assuming, by royal licence, the name ot Evans). 1st and 4th, ar. on a pile vert a chev. or, betw. three spear heads of the first, for Evans; 2nd and 3rd, or, on a pale betw. two eagles displ. vert an eagle displ. of the field, for Davies. Crests—1st, Evans: A wolf’s head ar. guttee de sang gorged with a collar gemel and erased gu. ; 2nd, Davies: A lion ramp. or, semee of crosses pattee fitchee az. gorged with a collar dancettee with a chain reflexed over the back sa. Motto—Fide et virtute. 36) (Glascoed, Oswestry, co. Montgomery; William Evans, Esq., of Glascoed, m. Ellen, dau. of John Williams, Esq., of Melyniog, same co., and rf. 1878, leaving a son, David Will ams Evans, Esq., of Glascoed). Quarterly, 1st and 4th. gu. a lion pass. guard. betw. four crosses moline, three in chief and one in base all ar., for Evans; 2nd and 3rd, sa. three mullets or, on a chief nebuly ar. as many lozenges az., for Dorset. Crest—A lion pass. guard. ar. charged on the body with two crosses moline az. and resting the dexter forepaw on an escocheon erminois thereon across moline betw. four lozenges also az. Motto—Festina lente. 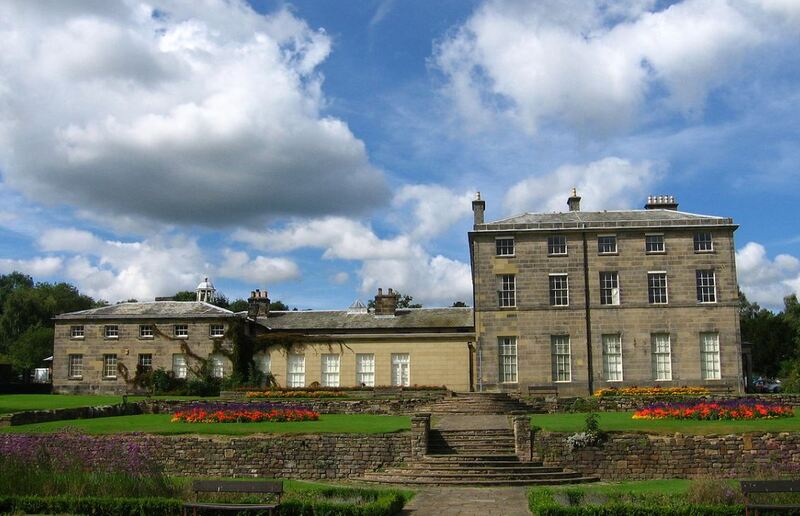 37) (Hurst House and Haydock Grange, co. Lancaster. Llanddoget Park, co. Denbigh, and Maenan House, co. Carnarvon, of ancient Cambrian descent: the present proprietor, Joseph Evans, Esq., J.P., is also Lord of the Manor of Parr, co. Lancaster). Sa. three nags’ heads erased ar. on a chief nebuly or, a pale gu. charged wiih an estoile ol the third, betw. two estoiles of the fourth. Crest—A nag’s head erased ar. betw. two estoiles or. Motto—In coelo quies. 38) (John Holditch Evans, Esq., of Bryn Issa, Pershore, co. Worcester, Edward Evans, Esq., of Brcnwylfa, co. Denbigh, sons of John Evans, Esq., of Leamington, co. Warwick, who d. 1865, and Edward Bickerton Evans, Esq., nf Whilbourne, co. Hereford, son of Edward Evans, Esq., of Thornloe House, co. Worcester, who if. 1871. Arms granted to Thomas Evans, Esq., of Upper Mill Pool, co. Montgomery, and enrolled with the ped. in the College of Arms, 24 July, 1867). Per pale ar. and gu. a liou pass, reguard. betw. two fleur-de-lis in chief and in base a bundle of rods banded all counterchanged. Crest—A lion pass. reguard ar. the body charged with three crosses moline gu. resting dexter paw upon a bundle of rods banded also gu Motto—Libertas. 39) (granted to Peter Faryan Sparke Evans, of Bristol, and Trinmore. Clifton Downs, Esq., in the Commission of the Peace for that city, and son of Lavington Evans, of Ottery St. Mary, co. Devon, gentleman, deceased). Mr. P. F. Sparke Evans is descended in the male line from Rev. Richard Evans, of Collumpton, Devon, and his wife, a dau. of Rev. William Yeo, M.A., Newton Abbott, 6. 1617; and also, through his grandmother, Sarah Perram, wife of William Burd Evans, of Ottery, and dau. of William Perram, by Sarah, his wife, dau. of Rev. John Lavington, M.A., from the old families of Lavington, Sparke (mentioned in church records in 1478) and Henley, one of whom was M.P. for Weymouth in the tiinc of the Commonwealth). Arg. on a bend engr. az. betw. two acorns slipped ppr. three leopards’ heads erased arg. Crest—Upon a rock a peacock ppr. charged on the breast with a quarterfoil or, resting dexter foot on a sprig of oak leaved fructed and slipped, also ppr. Motto—Deo favente. 40) (of Chester) (Recorded in WALES) Argent, three bends wavy, the middle one azure, the others vert; on the middle one three birds argent. 42) (granted to Rev. George Evans, of Armagh, and to Thomas Robert, and Edward Evans, Esqs., sons of Edward Evans, Esq., of Dungannon, co. Tyrone). Erm. three boar’s heads couped sa. around and langued gu. Crest: A demi lion ramp. reguard. erminois, holding betw. the paws a boar’s head, as in the arms. Motto: Libertas. 43) (Kilcreene, co. Kilkenny; bart., extinct. Sir William Evans, eldest son of Thomas Evans, Captain of a troop of horse, temp. Charles I., was created a bart. of Ireland, 1682; his dau. and eventual sole heiress, m. Francis Morres, ancestor of the Viscounts Mountmorres and Frankfort). Argent three boar’s heads couped sable. 44) (Tre Gastell, Wales). Gules a lion eampant within a bordure indented or. 45) (Harlakeden) Azure, a fesse ermine between three lions’s heads erased or. Crest: Between the attires of a stag or, an eagle reguardant with wings expanded. This is a patronymic or baptismal surname meaning “the son of Evan”, from the Welsh personal (first) name Evan or Lefan, Iefan, or Ifan which is a cognate of the male given name John. Others state it has possible Cornish origins. As a surname, the name seems to have first been Jevon, then Yevan, and lastly the modern form, Evan. In Gaelic or Welsh, one author states the word eofn means “bold” or “fearless”. Another source claims the personal name Evan is also derived from the Gaelic word Eóghan, meaning “youth” or “young warrior” or Scots for “right handed”. The name John itself is an ancient Hebrew (Yochanana) name meaning “God is gracious” or “Jehovah has favored me with a son”, a name born by John the Baptist, who baptized Jesus Christ in the Jordan River, as well as St. John the Evangelist, whereas the noun evan or even literally means “rock”. One source mentions the name derives from Iohannes or Iovannes, the Latinized form of the name John. In Old English, the name Evan may also translate as “The King” or “Heir of the Earth”. One source asserts the Evans family first held lands and titles in county Herefordshire, England, prior to the Norman Conquest of 1066 AD. One of the earliest arms granted to the Evans family of North Wales, who descended from Rhirid Flaidd, around 1070 AD, was blazoned in heraldry as color: Vert, a chevron ermine between three wolf’s heads argent, langued gules. According to legend and tradition, Rhirid Flaidd was “the son of Gwrgenau, who is supported by an obscure and doubtful pedigree going back to Cunedda Wledig, the progenitor of the House of Cunedda which had provided the kings of Gwynedd from the end of Roman Britain until 825”. This page serves not only as a great resource about the Evans arms and heraldry, but also the Evans family genealogy and history, as well as the Evans ancestry and pedigree. Common spelling variants or names with similar etymologies include Evanes, Eavans, Eveans, Evanse, Evands, Evanson, Evason, Evenson, Evens, Heavans, Ivings, Evins, Ifans, and Ivings. In Wales, the patronymic ab Evan results in the surname Bevan, a name that is also popular throughout the English speaking world. One foreign equivalent is Evens (Flemish). The last name Evans ranks 48th in popularity in the United Status as of the 2000 Census. The name ranks particularly high in the following nine states: Delaware, Utah, Ohio, Pennsylvania, North Carolina, Georgia, Maryland, Mississippi, and Alaska. The surname Isaac frequency/commonness ranks as follows in the British Isles: England (10th), Scotland (101th), Wales (5th), Ireland (446th) and Northern Ireland (182nd). In England, it ranks highest in counties Shropshire and Staffordshire. In Scotland, the surname Evans rankest highest in counties Clackmannanshire. In Wales, it ranks highest in Montgomeryshire. In Ireland, it ranks highest in county Wicklow. In Northern Ireland, it ranks highest in county Wicklow. The name is also present throughout the remainder English speaking world: Canada (93rd), New Zealand (53rd), Australia (20th), and South Africa (318th). The 1890 book Homes of Family Names by H.B. Guppy, states the following in regard to this surname: “Exceedingly numerous in North and South Wales and in the adjacent English counties of Shropshire and Monmouth. Thence it has spread, but in rapidly diminishing numbers to the midland counties and to the south – west of England. It is absent or singularly rare in the northern counties, a line from the Humber to the Mersey sharply defining its northward extension. Not one of the coast counties, from Norfolk round to the borders of Devon, is represented in my list. It would, therefore, appear that the invasion of England by the Evanses is by no means a complete one, though their advance on the metropolis is indicated by their scanty outposts in Beds, Bucks, and Berks”. This book is mistaken that Monmouth is an English county: it is in fact, a county in Wales. John Yevans was listed in the Records of Monmathshire in 1533 AD. The Rolls of Parliament document one Howell ap Yevan. The Calendar of Proceedings in Chancery document one David ap Evan.The Visitation of Gloucester lists one Joane Howe lap Evan Sais. The famous genealogist Bernard Burke’s book “The Landed Gentry” and “Peerage and Baronetage” discusses 19 noble/landed branches of the Evans family tree and the Evans genealogy for each. Thomas William Evans was an Esquire of Allestree Hall in county Derby who was a Justice of the Peace, Deputy Lieutenant, High Sheriff in 1872, and a Member of Parliament for South Derbyshire. He was born in 1821 and in 1846 he married Mary, daughter of Thomas John Gisborne of Holme Hall. Burke traces the lineage of this family back to Edmund Evans, Esq. of Upper Bonsall in Derby who was born in 1690. He married Rebecca, daughter of Thomas Gell of Middleton by Worksworh, with whom he had five issue: Edmund (Revered, of Mayfield, married Sarah Greaves), George (of Cromford, married Anne Nightingale), Henry (of Caldwell, married Martha Wood), Hannah (married Reverend Anthony Carr), and Thomas. His son Thomas Evans, Esquire of Derby and Treasurer of said county, married Sarah, daughter of William Evans, and had three issue with her: William (his heir), Edmund (of Yeldersely House, married Dorothy Coles), and Sarah (married Charles Upton). He later married Barbara Stubbs and had two issue with her: Barbara (married William Strutt) and Walter (of Darley Abbey, Lord of the Manor of Alsop-de-Dale, founder of Darley Church, married Elizabeth Strutt). His eldest son and heir was William, an Esquire of Darley, who in 1795, married Elizabeth, daughter of Jebediah Strutt of Belper) and with her four children: William, Elizabeth, Francis, and Helen (married Reverend John Edmund Carr). He died in 1796 and was succeeded by his only son William. This William Evans was an Esquire of Allestree Hall in county Derby, Justice of the Peace, Deputy Lieutenant, High Sheriff, and Member of Parliament for 16 years who was born in 1788. In 1820, he married Mary, daughter of Reverend Thomas Gisborne, and had issue with her, a son named Thomas William (mentioned at the beginning of this paragraph). The Evans Coat of Arms (often mistakenly called the Evans Family Crest) is blazoned in heraldry as follows: Quarterly, 1st and 4th, gyronny of right argent and vert, a lion rampant guardant or, for Evans: 2nd and 3rd per bend indented argent and gules two lions’ heads erased counterchanged ducally crowned or. Crest: In a charger a boar’s head erased argent. Samuel Evans, Esquire of Darley Abbey, married Caroline, daughter of Thomas Wollaston, and had four issue with her: Walter, Captain John of Highfield in Derby (married Lucy J. Hamilton), Henry of West Park, and Elizabeth (married Augustus T. Chetwode). His son and heir Walter Evans was an Esquire of Darley Abbey in county Derby, as well as a Justice of the Peace for that county. He was born in 1827 and in 1854 he married Susan Eliza, the youngest daughter of Thomas John Gisborne of Holme Hall, Bakewell and had a son with her named Arthur (born in 1855, died in 1870). Richard Weaver Evans was an Esquire of Eyton Hall in county Hereford, as well as a Justice of the Peace and Deputy Lieutenant. He succeeded his father in 1851. In 1828, he married Eleanor, daughter of Thomas Clutterbuck of Bushey, Hertfordshire and three children with her: Reverend Richard (married Julia Henrietta Clutterbuck), Henry Charles, and Edward James. The Evans genealogy of this branch of the Evans family tree is traced back to William Evans, Esquire of Treveiler, who was High Sheriff there, and in 1733, married Margaret, eldest daughter of William Morgan of Henblas, and had four issue with her: Charles (High Sheriff in 1752, married Elizabeth Lewis, and had issue with her), William (of Glenalow, had son named William as well), Dulcibella (married Reverend H. Rowlands), and Richard. His youngest son Richard Evans was Prebendary of Bangor and Rector of Kingsland and he married Jane, daughter of Reverend Robert Lloyd, and had three children with her: Richard Davies (died 1821), William (Rector of Kingsland, Vicar of Vow Chu, married Margaret Leaford, daughter of Anthony Goodwyn of Wirksworth), and Edward. His son Edward Evans was an Esquire of Eyton Hall, as well as a Justice of the Peace, Deputy Lieutenant, and Recorder of Leominster who marred Anne, daughter and heir of the Weaver family, and had a daughter with her named Jane (married Reverend Edward Richard Benyon of Culford) and two sons named Richard Weaver and Reverend Edward Charles, the later who married Francis Mary Peyton and the former who is discussed at the beginning of this paragraph. Jane Evans of Forde Abbey in county Dorset, Wimbledon Park, Surrey, was the widow of W. Bert Evans, Esquire, and Member of Parliament for Leominster, and the daughter of John Boyd of Broadmead in county Selkirk, Scotland. She was born in 1813 and had the following issue: William Herbert (Justice of the Peace, Deputy Lieutenant, and Lieutenant of the West Somerset Yeomanry Cavalary), Harry Saville Ward (Barrister-at-Law of the Inner Temple), Sarah Boyd, and Eleanor Isabella. Burke traces the Evans family ancestry to a family settled for generations at Elton in county Hereford, England who owned estates and land there. A one William Evans was born in around 1630 and he was the father of William. His son William, in 1689, married a member of the Herbert family, and had a son with her, also named William. This William Evans was born in 1691, and in 1731, married Elizabeth, the daughter of Owen (last name not reported here) of Ilbrightly in Salop, and had a son with her, also named William. This William was born in 1732 and in 1766, he married Catharine, daughter of Thomas Ward and Elizabeth Beckett, and he held the Herefordshire estates. He died in 1813 and was succeeded by her son, John Evans, Esqyire of May Fair, who was born around 1733, and in 1801, married Sarah, daughter of Charles Bartram, with whom he had three issue: William Bertram (Member of Parliament for Leominister), Captain John Thomas (born 1804, served in the King’s Dragoon Guards), and Ellen Francis (married James Lenigan, Justice of the Peace and Deputy Lieutenant of Castle Fforgery, Thurles). The Evans Coat of Arms (often mistakenly referred to as the Evans Family Crest) has the following blazon in the European art of heraldry: Quarterly: 1st and 4th, argent, three boars’ heads sable; 2nd and 3rd, for Ward, Azure, a cross pattee erminois between four fleur-de-lis or, impaling, for Boyd, azure fess chequy argent and gules between three roses in chief and a ??? in base of the second. Crests: A demi-lon reguardant, holding between his paws a boar’s head couped sable; A demi-lion rampany or. This branch of the Evans family tree was seated at Forde Abbey, Chard and Wimbledon Park House. Joseph Evans was an Esquire of Haydock Grange, Hurst House, Prescot, in county Lancaster, Llanet(?) Park and Meanan Houst, Llarwst, county Denbigh, and was a Justice of the Peace for Denbigh and Lancaster who was born in 1817 and was Lord of the Manor of the south ??? of Parr. Burke traces the Evans ancestry back to a wide-spread family of Evans in Church Stoke and neighboring counties in county Montgomery and in Chirbury in county Salop. Herbert Davies-Evans was an Esquire of Highmead in county Carmarhten as well as a Justice of the peace for the aforementioned county and Caridgan and a Deputy Lieutenant for Cardigan. He served in the Royal Navy, was a Lieutenant in the 10th Hussards and was born High Sheriff in 1870. He was born in 1842 and in 1869, he married Mary Eleanor Margret Geraldine, daughter of David Jones, and had four issue with her: Herbert, Delme William Campbell, Alan Gerywn Seymour, and Viola Augusta Margaret. He assumed the additional surnames of Evans when he succeeded the lands of his great-uncle, Herbert Evans, Esquire of High Mead. Mr. Herbert Davies descends paternally fromthe family of Davies of Penlan, and maternally from Cadifor ap Dinawal Ednowain ap Bradwen and Cadwgan, Lord of Ballyllyn. Their coat of arms was as follows: Quarterly, 1st and 4th, arg., on a pile vert a chevron or, between three spear-heads of the first, for Evans; 2nd and 3rd, or, on a pale between two eagles displayed vert an eagle displayed of the first, for Davies. Crests—1st, Evans : A wolf’s head or, guttee-de-sang gorged with a collar gemel and erased gu. ; 2nd, Davies : A lion rampant or, semee of crosses pattee fitchee az. gorged with a collar dancettee, with a chain reflexed over the back sa. Motto—Fide et virtute. In this section, Burke states one should see the section of the family, Power of Hill Court. 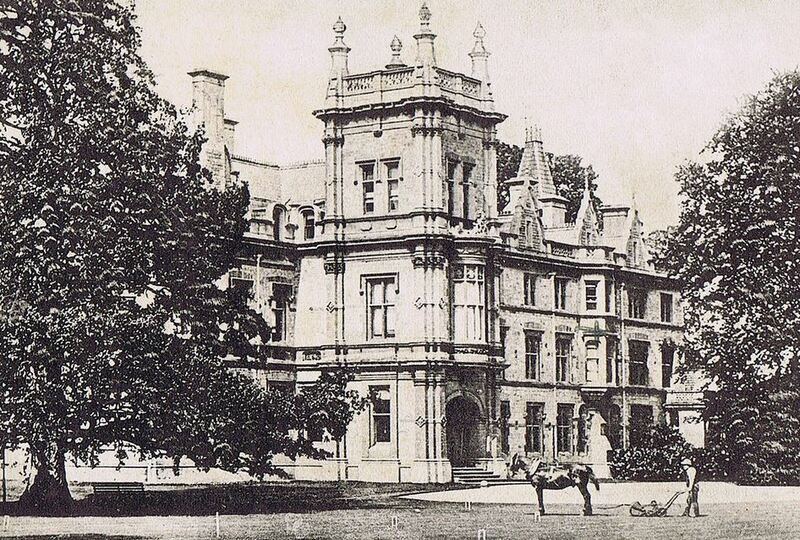 Thomas Percival Evans was Esquire of Moreton Court in county Hereford who was born in July of 1864. He was of royal descent through his ancestor, Sir Percival Willoughby. Burke traces the lineage of Evans genealogy of this branch of the family tree back to Reverend Morgan Evans, B.C.L, who was Justice of the Peace and was born in 1664, and was of ancient Welsh ancestry. He was the Rector of Richards Castle (near Ludlow), Vicar of Weobley, Vicar of Newland, Prebendary of St. Dubritius in Llandaff Cathedral, and Chancellor of Llandaff. In 1694, he married Francis, daughter of William Sabine of Kington, and had issue with her: John (born 1695, Fellow of Oriel College, Archdeacon of Llandaff, Prebendary of Warham), Thomas, Elizabeth (married Reverend Thomas Hill), Margaret (married Reverend William Price), Frances (married Reverend Thomas Willym), and Jane (married Reverend William Davies). His son Reverend Thomas Evans was born in 1708 who, in 1732, married his cousin Jane, daughter of William Tyler. His eldest surviving son was Reverend Thomas Evans, A.M. who was born in 1741 and was Vicar of King’s Pyon, of Birlet, and of Yazor, and Rector of Bishtone. Burke continues to give the Evans pedigree for several more generations. The Evans Coat of Arms (erroneously called the Evans Family Crest) is blazoned in heraldry as follows: Quarterly : 1st and 4th, per fess nebulae argent and sable three boars’ heads in chief and one in base, erased, counterchanged, for Evans ; 2nd and 3rd, argent, two chevronel chief three gryphons passant of the last, for Finch. Crest: A lion rampant regardant bendy of six ermine and sable, supporting a tilting spear erect proper enfiled with a boar’s head erased (tincture?). John Arthur Evans was an Esquire of North Tuddenham of county Norfolk, and of Dene, county Oxford, as well as Captain Ithe E.I.C.S. In 1853, he married the Honorable Margaret Eleanor Georginia Fraser, sister of Alexander, 17th Lord Saltoun and had two daughters and one son with her. Burke states with family is of Welsh descent and was originally seated in county Carmarthen, Wales, but they moved to Ireland during the reign of King James I. Thomas Evans settled at Bury St. Edmunds in Suffolk and in 1697, he married Hannah, daughter of Thomas Case of Bardolph. They had a son together also named Thomas, who was an Esquire and Barrister-at-Law and Recorder of Bury St. Edmunds. In 1725, he married Mary, daughter of an Esquire in Kneesworth of county Cambridge, and had a son with her also named Thomas. Burke continues to discuss the Evans pedigree and family tree for several more generations. The Evans Coat of arms is blazoned as following: Argent, three boar’s heads couped sable. Edward Bickerton Evans was an Esquire of Whitbourn Hall in county Hereford, as well as a Justice of the Peace for Worcester and a Deputy Lieutenant. He was born in 1819, and in 1846, he married a woman named Margaret, the daughter of Peter (last name not known) of Wallace Grove in Glasdow and had two children with her. He was the only son of Edward Evans, Esq. and Justice of the Peace for the city of Worcester, who died in 1870. The Evans Coat of Arms (often erroneously called the Evans Family Crest) is blazoned in heraldry as follows: Per pale argent and gules a lion passant regardant between two fleur-de-lis in chief, and in base a bundle of (???) all counterchanged. Crest: A lion passant regardant argent, charged on the body with three crosses Moline, the dexter paw resting on a bundle of rods banded and ??. Elystan Eyre Evans, Esquire of Ash Hill Towers in county Limerick, Ireland, was born in 1845 and succeeded his grandfather in 1856. In 1876, he married Isabella, widow of Richard Beardslet, U.S. Consul General in Egypt, and daughter of Reverend Philip Smith of Cherrymount, Meath. Burke traces this branch of the Evans family tree or the Evans genealogy/lineage back to Colonel Thomas Evans of Miltown Castle in county Cork, who was a Member of Parliament for Castle Martyr. In May of 1722, he married Mary, third daughter of James Walker of Castletown, and had four issue with her: Eyre, Reverend Thomas Waller (Rector of Dunmanway in Cork), John (Captain in the 18th Regiment, married Catherine Gookin), Mary (married George Bruce), and Dorothy (married Thomas Lucas of Richfordstown). He died in 1752 and was succeeded by his eldest son Eyre. This Eyre Evans was an Esquire of Miltown Castle who in 1757, married Mary, daughter and heiress of Thomas Williams of Ballymenagh in Limerick, and had five children with her: Eyre, Mary (married Reverend Jonathan Bruce, her first cousin), Elizabeth, Abigail, and Katherine (married Thomas Lloyd of Beechmount). He was succeeded by his only son, Eyre Evans of Miltown Castle and Ash Hill Towers, who was born in 1773, and he married, in 1805, Anna, daughter of Robert Maunsell, and had the following issue with her: Eyre (born 1806, married Sophia Crofton, had five issue), Robert Maunsell (Archdeacon of Cloyne, married Deborah Purdon), George Thomas (of Clooncavin, Otago, New Zealand, a Major of the 74th Highkanders, married Louisa Barbara Corry), Thomas Williams (of Crieffe Lodge, Otago, New Zealand, Captain 74th Highlanders, married Helen Elizabeth, daughter and co-heir of David Stewart Moncrieffe), John Freke (Justice of the Peace and Barrister-at-Law, married Julia Bruce, daughter and co-heir of David Stewart Moncrieffe), Henry Frederick (served in the 21st Fusiliers, born 1821, married Sarah Anne, daughter and co-heir of David Stewart Moncrieffe), Anna Maria Stone (married Reverend Robert Hedges Maunsell Eyre), Carolina Louisa (married James Ogilvie Grant), and Elizabeth (married Peter Hay). He died in 1810. The Evans Coat of Arms for this branch of the family tree is blazoned in heraldry as follows: Quarterly, 1st and 4th, argent, three boars’ heads couped sable, for Evans, 2nd, gules, a lion rampant within a bordure or, for Williams; 3rd, or, a lion rampant reguardant, sable, for Morrice. Crest: A demi-lion reguardant or, holding between his paws a boar’s head couped sable. Thomas D’Arcy-Evans, Esquire of Knockaderry House in Limerick, Justice of the Peace for Cork and Limerick was born in 1809, and in 1835, he married Thomasina Eliza, daughter and co-heir of John Boles Reeves, Esq. of Clare Street, Dublin, and had five issue with her: Thomas D’Arcy, Eyre George Elystan, Anna Maria, Thomasina Mary (married Samuel P. Prosser), and Catherine Sophia (married George Peirce). 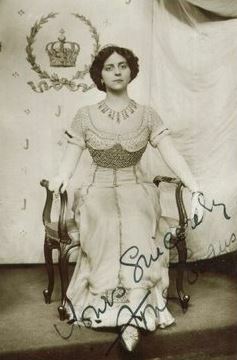 He later married Elizabeth, daughter of George Studdert of Clunderlaw. Burke traces the lineage or ancestry back to Reverend Thomas Walkers Evans, the Rector of Dunmanway in county Cork, the son of Thomas of Miltown Castle). In 1763, he married Catherine, daughter of James Conyers Darcy of Knockaderry House in Limerick, the sole heiress of her brother, Colonel James D’Arcy, and had the following children with her: Thomas, James, Eyre (married Elizabeth Austin), John (Captain in the 24th regiment, killed at Talavera), Elizabeth Waller, Catherine (married Sampon Beamish). He died in 1797 and was succeeded by his son, Thomas D’Arcy Evans, Esquire of Knockaderry House. In 1814, he married Brabazon, daughter of Richard Taylour of Holly Park, but died without posterity. In 1833, he was succeeded by his brother, James. James was also an Esquire of Knockderry House and in 1800 he married Arabella Massy, daughter of Samuel Leake, and by her had the following children: Thomas D’arcy (mentioned at the beginning of this paragraph), John D’Arcy (married Marian, daughter of William Wallace of Dublin), Catherine (married Robert Dean Hay), Elizabeth (married John Evans Lucas), Emily Mary (married Thomas William Locke), and Arabella (married William O’Hara). He secondly married Ann Maria, a widow of the FitzGerald Family. He died in 1848. The Evans Coat of Arms (mistakenly called the Evans Family Crest) is blazoned in heraldry as follows: Argent, three boar’s heads couped sable, quartering D’Arcy. Crests: 1st, Evans, A demi-lion rampant reguardant or, holding between the paws a boar’s head couped sable; 2nd, D’Arcy: A spear broken in three pieces or, two in saltire and one in pale, headed proper, banded together at the middle by a ribbon. They were seated at Knockaderry House, Knockaderry, near Newcastle West, Limerick. John Westropp Evans, Esquire of Carker House, county Cork, was a Justice of the Peace born on 1831. He succeeded his father in 1864. He married Anne, daughter of M. O’Coner, and had eight issue with her: Ralph, Alfred, Roberts Walter, Anne, Henrietta Thomasina, Georginia Elizabeth, Mary, and Julia Christiana. Burke discusses the Evans genealogy and traces the family ancestry of this branch of the Evans family tree back to Nathaniel Evans, Esquire of Griston in Limerck, who may have been the first family member to settle in Ireland, who came from Yorkshire, England. He had a son also named Nathaniel who was an Esquire of Carker in county Cork. He married Bridget, daughter of Nicholas Green and had two sons and one daughter with her. His son was Nicholas Green Evans who married Hannah, daughter of Randal Roberts of Britfieldstown and had the following issue with her: Nicholas Green, Nathaniel (married a daughter of George Parker), Roberts (Major General of the Royal Artillery, married Martha Stephens), Henry (Vice Admiral in the Royal Navy and Member of Parliament for Wexford, Ireland, married Elizabeth Nash), and Martha (married Thomas Newnham of Lehena). His eldest son Nicholas, in 1790, married Anne, daughter of Ralph Westropp of Atyflin, and had the following issue with her: Ralph, Nicholas, Hannah (married George Newenham), John, Mary (married member of the Norcott family), Eliza, Emma, and Ellen. His eldest son Ralph Evans, in 1818, married his cousin, Henrietta, daughter of Ralph Westropp, and had seven issue with her: Nicholas Green, John Westropp, Harriette (married Captain Napoleon Herroquelle), Thomas Julia (married Geroge Westropp), Juliana, Anne, and Georgiana. Edward Evans was an Esquire of Gortmerron House in Tyrone, who succeeded his brother in July 1876. The Evans genealogy begins with Thomas Evans, who is believed to descend from Ethelystan Glodrydd, Prince of Fer (???) Wales, and was a Captaion of a troop of horse in England during the reign of King Charles I. He served in Ireland in the Rebel (???) in 1641, and received grants of land in county Kilenny. He obtained lands in Queen’s County after the Civil War. He became an Alderman of Kilkenny and served as Mayor in the 1650s and 1660s. He married Katherine Weldon and had issue with herL Ellen, William (of Kicreene, created a Baronet in 1682, His daughter and heiress, Catherine, married Francis Morres of Castle Morres), and Edward. Edward Evans, Esq. was Sheriff of Kilkenny in 1665 and commanded a troop in the Earl of Arran’s Horse, at the Battle of the Boyne. He married and had issue named Henry and Edward. Burke discusses the Evans pedigree for several more generations. The Evans Coat of Arms was blazoned as follows: Ermine, three boar’s heads couped sable langued gules. Crest: A demi-lion rampant, reguardant erminois, holding between his paws a boar’s head couped sable. The family was armigerous and bore the following armorial bearing: Argent, three boars’ heads couped sable. Crest: A demi-lion rampany reguardant or, holding between the paws a boar’s head couped sable. This family was seated in Lough Park, Castlepollard in Westmeath. Sir Evelyn Ward Evans, 3rd Baronet, of Tubbendens, Kent, was born in 1883 and succeeded his brother in 1946. In 1909, he married Primrose Mary, daughter of J.W. Brown of Eastrop Grange. The lineage traces back to William Evans of Crumpsall Grange, Cheetham Hill, county Lancaster, son of Joshua Evans of Bolton, born in 1807. In 1834, William married Mary, daughter of Matthew Nicholson of Whitemore Place, have eight issue with her: Sir Francis Henry (1st Baronet), Jessie (married Constantine Tafel), Emily (married Sir Charles Seely), Florence (married John Jackson of Stubben Edge), Adeline (married George Pearson), Margaret (married James George Cotton Minchin). His second son, Sir Francis Henry Evans, 1st Baronet, K.C.M.G, of Tubbendens, Oprington, Kent, one of the Lieutenant for the City of London, was a Member of Parliament for Southampton and Maidstone and was created a Baronet in 1902. He was born in 1840. In 1872, he married Marie de Grasse, daughter of Samuel Stevens of Albany, NY, and had the following issue with her: Sir Murland de Grasse (2nd Baronet), Jocelyn Herle de Grasse (married Blanche Rumsey), Sir Evelyn Ward (3rd and present Baronet), Frances de Grasse, and Gwladys Marie de Grasse (married Arthur Harold Webster and later Captain Iain Ramsay). The Revered Sir Murland de Grasse Evans, 2nd Baronet, in the Holy Orders Curate of St. Bartholomew the Great, Major of the Fifth London Brigade, Staff Lieutenant, had many other titles and accomplishment, was born in 1874. In 1909, he married Evangeline Mary, daughter of Major Charles Newbourne, and later Georgiana Constance, daughter of Captain George Styles. The coat of arms is blazoned as follows: Gules, a lion rampant between three eagle’s heads erased a bordure engrailed all argent. Crest: In front of a demi lion gules charged on the shoulder with a cross crosslet argent, an anchor fessewise the flukes to the dexter proper. Motto: Omnia si patienter. Sir Walter Harry Evans, 1st Baronet, of Wightwick Hall, Wolverhampton in county Stafford, was born in 1872 and created a Baronet in 1920. In 1907, he married Margaret Mary, daughter of Thomas Adney Dickens of Ellderdine, and had four issue with her: Walter Terence (born 1911), Eileen Margaret (born 1908, married Reverend Charles Everard Cradock Royds), Anthony Adney, and Diana Gillian Mary (born 1926). Burke traces the lineage of this branch of the Evans family tree and genealogy back to John Evans of West Bromwich, Staffordshire, who was born in 1782. John had a son named Joseph, who was of Culhwell House in Stafford, born 1809. He in then had a son named Joseph Evans, of the Lindens, Wolvertonhampton, who was a Justice of the Peace born in 1843, who in 1869, married Christina, daughter of James Shelley of Trysull, and had three issue with her: Joseph Osmund, Sir Walter Harry (1st Baronet), and George Herbert (married Mary Stevens). The Evans Coat of Arms is blazoned as follows: Gyronny gules and or, overall a lion passant between two fleur-de-lis in pale sable. Crest: In front of a wall embattled and masoned proper, a lion as in the arms. Motto: Fide et virtute. This family was seated at Oakland Park, Newnham in county Gloucester. The lineage of this line traces back to Evan Evans of Wain, county Cardigan Wales, who in 1841, married Mary, daughter of William Evans, with whom he had one son. This son was Sir William Gwynne-Evans, 1st Baronet, who was born in 1845 and created a Baronet in 1913. He married Mary Anna, daughter of Evan Williams of Berthllyd, and had the following issue with her: Sir Evan Gwynne (2nd Baronet), Edith Mary, Beatrice Allen (married William Page May), Jean Anne (married Guy Estelle Morley of Treetops), Elizabeth Wynne Gertrude, and Ethel Irene Penelope (married Edward Wallace Hadingham). He secondly married Blanche Sophia, daughter of Reverend Charles Eldridge Besant, and had two issue with her: John (born 1910), and Bettina (born 1912). Sir Evan Gwnne Gynne-Evans, 2nd Baronet, was of Oaklans Park in Gloucester who was a Lietenant in the R.A.S.C and was a High Sheriff who was born in 1877. He succeeded his father in 1927 and in 1908, married Ada Jane, daughter of Walter Scott Andrews of New York, and had had a son with her named Ian William, a Lieutenant in the Royal Navy who married twice and had issue. The Evans Coat of Arms (mistakenly called the Evans Family Crest) has the following heraldic blazon: Per pale sable and gules a fesse or, in chief a dagger erect within an annulet both of the last between two boar’s heads couped argent, and the like in base. Crest: Upon a rock proper, a boar’s head couped sable between daggers erect or. Motto: Heb Elynion Heb Gymmeriad. The lineage of this line traces back to Thomas Evans of Tyreymynech Guilsfield in county Montgomery who died in 1742, having issue with his with Elizabeth. One of his sons was named Thomas, who married Elizabeth, daughter of John Jones, with whom he had a son, also named Thomas. Burke discusses the lineage of this Evans family tree branch for several more generations before mentioning Sir William Shirley Worthington-Evans, 2nd Baronet, of Colchester, Essex, a Major in the Royal Army and a Barrister-at-Law of the Inner Temple, who was born in 1904. He succeeded his father in 1931. He married his first wife in 1931, named Joan Irene, daughter of H. Kilby Pears, and had two issue with her: Sarah (born 1929) and Anne Louise (married 1834). He later married Hazel Wells, daughter of Fearnley Wells Owens. Laurance Evans, age 15, came to Virginia aboard the James in 1622. Leonard Evans, age 22, came to Virginia aboard the Bonaventure in January 1634. David Evans, age 22, came to St. Christopher’s aboard the Paul of London in April 1635. Nicholas Evans, age 16, came to Barbados aboard the Peter Bonaventure in 1635, as well as a one O. Evans, age 17, and Thomas Evans, age 20. Andrew Evans, age 16, came to the Barbados aboard the Ann & Elizabeth in 1635. Joseph Evans, age 22, came to Virginia aboard the Thomas & John in June 1635. William Evans, age 23, came to Virginia aboard the America in June 1635. William Evans, age 25, came to Virginia aboard the Primrose in July 1635. Joseph Evans, age 19, came to Virginia aboard the George in August 1635. Richard Evans, age 21, came to St. Christopher’s aboard the John of London in October 1635, as did Lewes Evans, age 25. Hugh Evans, age 18, came to the Barbados aboard the Expedition in November 1635, as did Edward Evans, age 22. Thomas Evans, age 23, came to the Barbados aboard the Falcon in December of 1635. Griffinn Evans, age 40, came in December 1635 “in a Catch to the Downes”. A one Lawrance Evans was recorded as living in Virginia in February 1623 “at Jordans Jorney”, as was Richard Evans “at Basse Chouse”, as was Thomas Evans “at Elizabeth Cittie”. Other recorded in this year in Virginia were John, Marke, George, Clement, John and William Evans. The following were recorded among the dead in Virginia in February 1623: Christopher Evans. Lewis Evans came to Virginia aboard the Unity in 1679. John Evans owned 10 acres of land in the parish of St. George, Barbados. 1) David Evans of Boston in 1654 who was a merchant. He died in 1663 leaving a widow named Mary. He had three issue: David, Elizabeth, and Martha. 2) Henry Evans of Boston 1643, a husbandman, and a freeman in 1645. His wife was named Amy who came in the year prior from the church of Roxbury. 4) John Evans of Roxbury, with his wife Mary, had issue John (1671), Peter (1673), and Peter (1674). He may have served in Philip’s War. Perhaps he lost his wife after he moved to Hatfield, where he married Mary, widow of Experience Hinsdale, daughter of John Hawke, had Elinor, 1678, Jonathan, 1680, and Randall, 1682 and he moved to Deerfield around 1685. 5) John Evans of Dover, acted as a commissioner with others to settle York, Dover, and Kittery boundary. 6) Philip Evans, of Newbury, by wife Deborah, had William (1687), Elizabeth (1689), and John (1692). 7) Richard Evans of Dorchester who was a freeman in 1643, married a woman named Mary and had issue with her named Richard, Mary, and Matthias, and likely Joanna and Hannah. 8) Richard Evans of Rehoboth, who had a son names Richard (1681). 9) Robert Evans, of Dover, 1665, had issue named Robert (1665), Edward (1667), Jonathan (1669), Elizabeth (1672) with his wife named Elizabeth. He died in 1689 or 1697, perhaps died on cancer. 12) Thomas Evans of Salibury, who married Hannah Brown in 1686 and had issue named Ann (1687), John (1689), Abigail (1692), Thomas (1696), and Hannah (1698). 13) William Evans, of Taunton, 1643, probably died before 1676, or may have been the same as William of Gloucester, one of the selectmen, 1647-8, who was of Ipswich, 1656. Early settlers in colonial America bearing this surname include Jonathan Evans (Virginia 1707), Joseph Evans (Virginia 1711), Lydia Evans (Pennsylvania), Philip Evans (Virginia 1714), and Griffeth Evans (Virginia 1714). In Canada, one of the earliest settlers bearing this last name was Griffith Evans who came to Nova Scotia in 1749. In Australia, of the first bearers of this surname was Joseph Evans, a convict from Somerset, England who came aboard the Ann in 1809 who settled in New South Wales (then a penal colony). In New Zealand, Thomas Evans came to Kapiti in 1839. Charles Bolton’s American Armory (1927) contains one entry for this surname: Gu three chev argent. Crest: a paschal lamb. Motto: Suum cuique tributo. Bookplate W. E. Evans. Crozier’s General Armory (1904) contains one entry for this name: Lott Evans of Philadelphia, Pennsylvania in 1681, who came from Wales, and was the descendant of Elystan Gloddryad, Founder of the Fourth Royal Tribe of Wales. Quarterly: 1st and 4th: Argent, three boars’ heads couped sable, 2nd and 3rd: Gules, a lion rampant reguardant argent: Crest: A demi-lion reguardant argent, holding between his paws a boar’s head couped sable. Motto: Libertas. 1) James Evans was an M.D. born in Marion, South Carolina in 1831. He was a surgeon in the 3rd South Carolina Regiment of the Confederate States of America, the Secretary of the State Board of Health of South Carolina, the State Engineer of Arkansas, and a graduate of the University of Pennsylvania. In 1861, he married Maria Antionette, daughter of William Alexander Powell, Esq. of Leesburg, Virginia and Lucy Peachy Lee, with whom he had the following nine children: Powell (married Julia Estelle Merchant), William Alexander, James Jr., Thomas, Llewellyn Stuart, Jane Beverley, Maria Lee (married Frank B. Gary of Abbevile, SC), Marie Antoinette (married Henry Carrington Riley of Richmond, VA), and Lucy Peachy (married Reverend Caleb Brecknall Kneaoles Weed of East Orange, NJ). The Evans Coat of Arms (mistakenly called the Evans Family Crest) that he bore is blazoned in heraldry as follows: Argent, a chevron between three boars’ heads couped sable. Crest: On a ducal coronet or, a board’s head fesseways erased sable. Motto: Libertas. He resided in Florence, South Carolina. He was the son of Honorable Thomas Evans of Marion, South Carolina, who was a State Senator and Jane Beverly (daughter of George and Martha Daniel). James descended from Ethelystan Glodrydd, Price of Ferlys, the founder of the 4th Royal Tribe of Wales. 2) Henry Evans of New York City was born in Houston, Texas in 1860. In 1892, he married Mary Roland Lopez of Greensboro, Alabama. He bore the following heraldic arms: (Harlakeden) Azure, a fesse ermine between three lions’s heads erased or. Crest: Between the attires of a stag or, an eagle reguardant with wings expanded. He was the son of Joseph Henry Evans (born 1835 in Tennessee, Colonel in the Confederate Army) and Cora Wilbur (daughter of Edward Wyllys Taylor). He was 11th in descent from Governor William Bradford of Austerfield, England (born 1589). He also descended from Governor John Haynes of Old Holt who married Mabel Harlakenden, daughter of Roger Harlakenden (born 1594) who purchased of the Earl of Oxford the Manor and Park of Earl’s Colne, Essex. 3) Lott Evans, who emigrated to Pennsylvania with William Penn in 1681 bore the following Evan Coat of Arms (often mistakenly called the Evans Family Crest): Argent, three boar’s heads couped sable, quartering gules, a lion rampant reguardant argent. Crest: A demi-lion rampant reguardant holding between the paws a boar’s head couped sable. 1) William Evans of London, a gentlemen born in county Merioneth, Wales, granted 20 November 1581, by G. Dethick. 9) Amy Evans (1884-1983) who was an Welsh soprano and actress known for performance in opera, recitals, and oratorio, as well as for playing Princess Helena in A Waltz Dream in 1911, 10) Alvin Evans (1845-1906) who was a Republican member of the US House of Representatives for Pennsylvania during the early 1900s who served in the American Civil War to repel Confederate invasion of his state, 11) Bob Overton Evans (1927-2004) who was a pioneer in the computer industry and a corporate executive at IBM who led the groundbreaking development of compatible computers, and 12) Clement Anselm Evans (1833-1911) who was an Confederate Infantry Army General from Stewart County Georgia who was also a preacher, author, historian and politician. The main symbol of heraldry present in the Evans Coat of Arms (erroneously called the Evans Family Crest) is the boar’s head. In the middle ages, the wild boar, a far more fearsome creature than its domesticated relative, the pig was a much more commonly seen animal than today. It was also known as a sanglier. It can appear in many of the same poses that we see for the lion, but has its own (easily imagined!) position known as enraged! We should not be surprised then that this “fierce combatant” is said to be associated with the warrior.